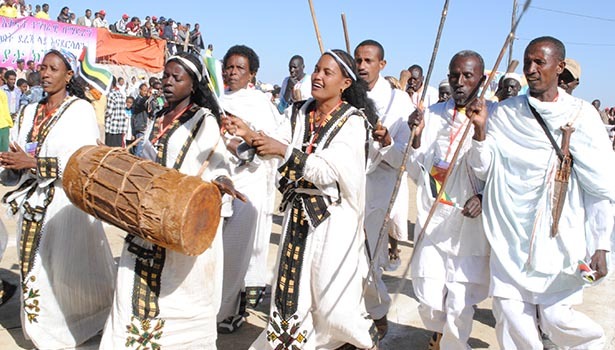 Celebrated on the 19th of every January (20th on leap year), it’s among the biggest religious festival in Ethiopia. Timkat celebrates the Baptism of Jesus in the Jordan River. During the ceremony of Timkat, the Tabot, a model of the Ark of the Covenant which is present on every Ethiopian altar is covered in rich cloth and brought on the head of the priest. The Tabot represents the manifestation of Jesus as a Messiah when he came to the Jordan for Baptism. On the eve of Timkat, the sacred Tabot, a tablet of wood or stone is taken from each church and carried on by priest to the central place where the grand ceremony takes place. After the ceremony the Tabot is returned to its consecrated resting place with more colorful ceremony. By noon on Timkat day a large crowd assembles at the ritual site and the Holy Ark is escorted back to its church in colorful procession. Suggested place to celebrate Timkat is Gondar & Addis Ababa. Ethiopian Christmas also known as Genna and Lidet is celebrated on every January 7 (Jan 8 on Leap year). The day is celebrated among all Christians with colorful dresses, traditional food and drinks. All churches give service all night through with the mass attending the service. In the country side, though these days less frequently exercised, there is an indigenous sport named Genna, similar to hockey played among teams trying to pass into opponents territory. This celebration can be witnessed in combination with any attraction however since January 7 is also the birth date of King Lalibela, it is celebrated more colorfully at the Rock hewn churches of Lalibela where the ceremony takes place in ancient churches carved from solid volcanic rock. Meskel, which means “Cross” is another important religious festival that has been celebrated for over 1,600 years . It is celebrated to commemorate the discovery of the cross by Empress Helena, the mother of Constantine the Great, upon which Jesus was crucified. According to sources, the original event took place on 19 March, AD 326, and is currently celebrated on 27 September. Many of the rites observed throughout the festival are said to be directly connected to the legend of Empress Helena. On the eve of Maskal, tall ranches are tied together with yellow daisies popularly called Meskel flowers placed at the top. The ranches are gathered together in front of a huge mass, deacons, quires and the Patriarch of the Christian churches and ignited. This symbolizes the action of the Empress who lit incense and prayed for help when no one would show her the Holy sepulcher. The smoke was then said to have drifted to its location where she dug and found three crosses among which the one is the True Cross. 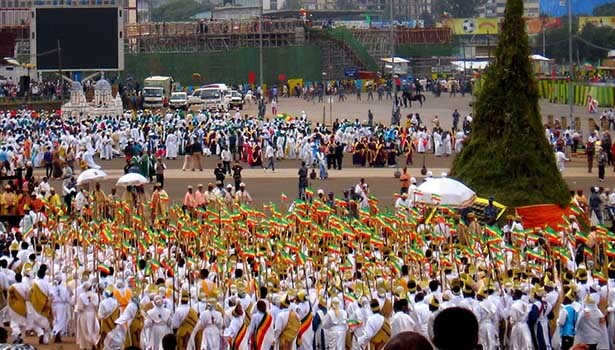 Ethiopia is country of many nations, nationalities and peoples, each having their own distinct culture, history, language and way of life. 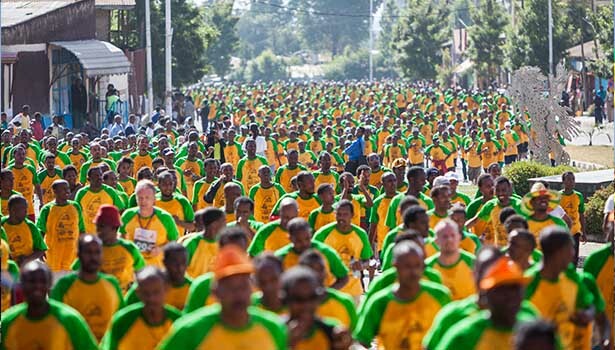 Annually the Ethiopian people come together in their locality to celebrate their unique culture and promote unity. Dressed in one’s own traditional dress and singing in one’s own tongue, people gather in a colorful and festive vibe.